The IPS Strategic Capital Absolute Return Strategy (ARS) is a cutting edge hedged U.S. equity strategy which enables individual investors to participate in the type of sophisticated approach generally reserved for institutional investors and ultra high net worth investors. It is a low-risk alternative which has delivered consistent returns while adding excellent portfolio diversification. and utilizes strict risk management parameters, actively monitoring and rebalancing market exposure. We manage money structurally, which allows us to protect against unexpected market events as well as benefit from volatility, as evidenced by our impressive downside performance. We do not use technical, fundamental, or econometric triggers, which allows us to keep a completely agnostic view on market direction. Our primary goal is to generate consistent, asymmetric returns, i.e. an upside capture ratio that is greater than our downside capture ratio. We do this by always being long calls and long puts in the portfolio while generating a positive carry so as not to lose value in flat markets. 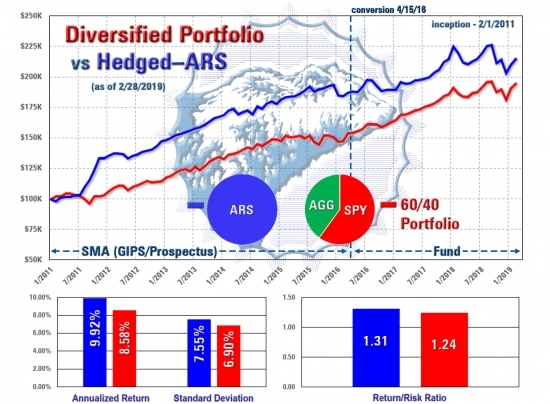 Unlike other option-based strategies, which tend to use excessive leverage to generate alpha, the IPS ARS uses zero leverage on the downside, which creates an asymmetrical return profile. This gives our investors peace of mind knowing that we should always lose less than the market on the downside and perform considerably better than the market during significant declines. 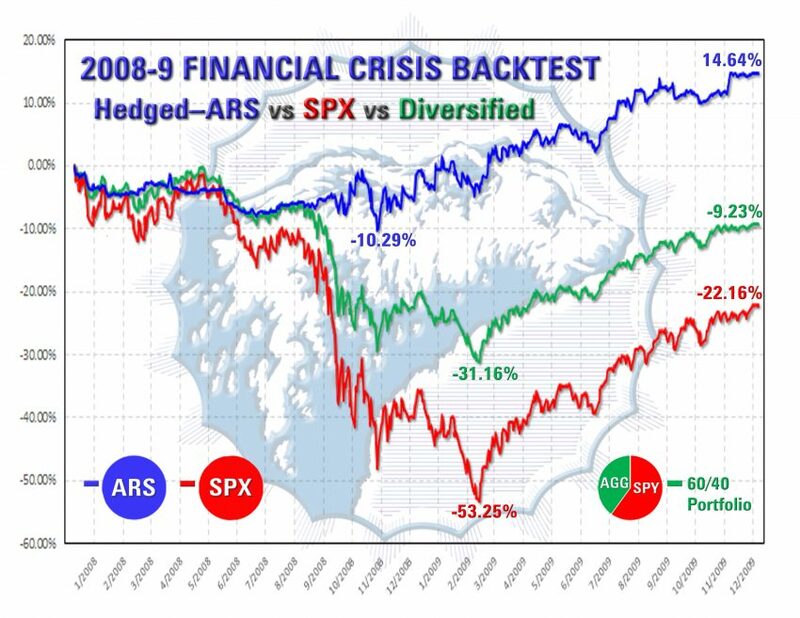 especially if you are already “diversified” to lessen the blow of a market correction? The reality is that most portfolios are short volatility and will continue to perform well as long as the market is going up. However, if volatility should rise in any meaningful way, the losses to investors, especially retirees, could be quite painful. The ARS is always long volatility, which means that if we should experience significant volatility, the ARS will actually benefit. 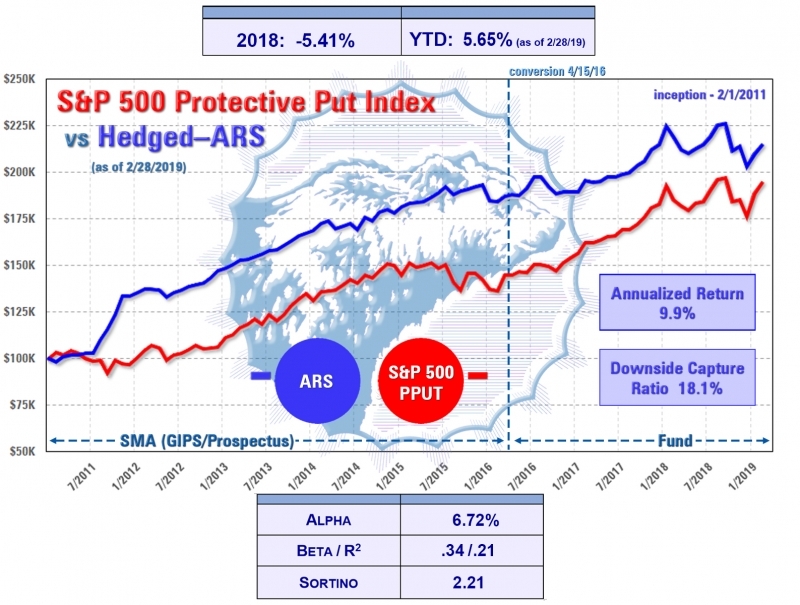 Unfortunately, due to the heavy cost of holding insurance (a critical problem solved by the ARS positive carry), it is not feasible for most portfolios to protect with direct hedges. The main approach used to protect wealth is to diversify into assets that hopefully will go up if the market drops, i.e. bonds. What happens, though, when you combine a bull market ripe for a major correction together with historically low interest rates anticipated to rise? The reasonable assumption is that at some point, stocks and bonds will simultaneously drop in value. How do you prepare for such a scenario? At IPS, we do not attempt to predict or time, and we know it is too late to put on a seat belt after a crash. We are hedged all of the time, and our asymmetric risk profile enables our investors to participate in the upside while always protecting against the downside. 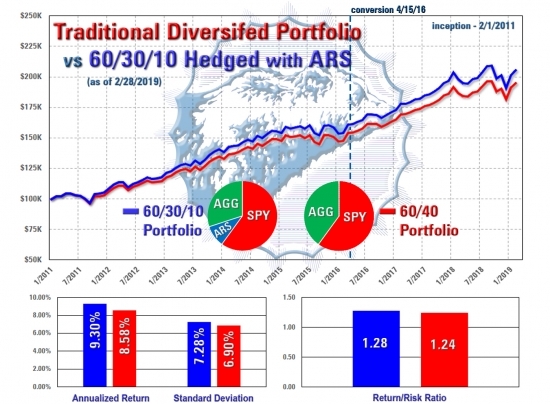 If fact by simply altering the traditional 60/40 portfolio mix by adding the ARS, you can significantly strengthen, truly diversify, and reduce risk within a portfolio. Below are comparisons of a 60/40 mix (SPY/AGG) and a 60/30/10 mix (SPY/AGG/ARS) with the ARS added. The performance data shown in this presentation represents past performance data. The Absolute Return Strategy performance is representative of a size-weighted composite of the accounts managed by the firm classified as the Absolute Return Strategy-Moderate composite. The returns represent net returns of clients invested into the strategy, accounting for the 1% annual management fee. Please note that all performance in 2011 represents one non-fee-paying account comprised of the firm’s capital. Due to the nature of composite performance, it cannot be guaranteed that an investor in a specific composite will receive the same gains as the size-weighted average of the composite. 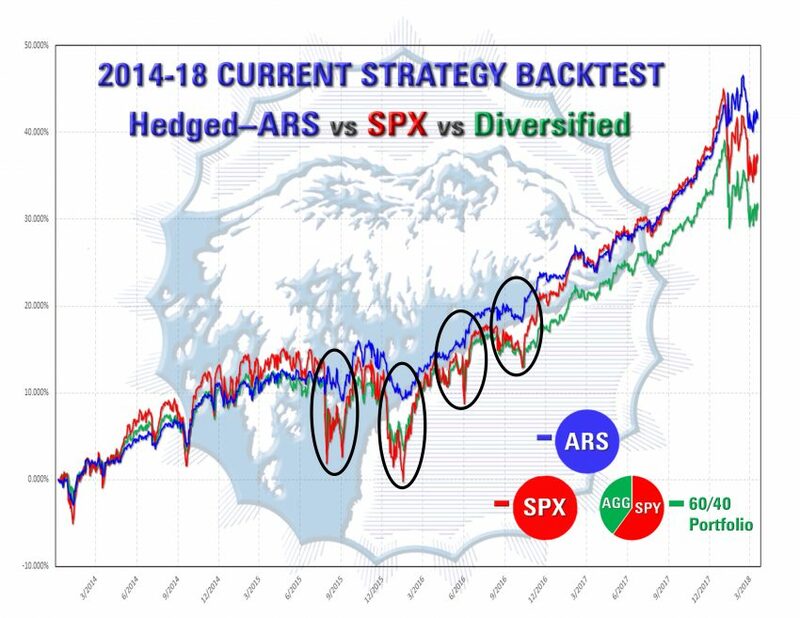 As of April of 2016, the separately managed accounts in the ARS-Moderate composite gain their exposure to the ARS through a 40 Act fund that utilizes the Absolute Return Strategy. The performance of the ARS shown on this sheet still represents the size-weighted average of the SMA’s that are part of the ARS-Moderate. The performance of the SPY represents the SPRD S&P 500 ETF Trust and includes management fees and dividends. The performance of the AGG represents the iShares Core U.S. Aggregate Bond ETF and includes management fees and dividends. you will have to make 100% just to get back to breakeven. The ARS is designed to lose far less in such an event and recover much quicker. Although we have returns dating back to 2011, as part of our process we believe it is important to take the current strategy and backtest it through periods of extreme stress. For example, here is the result for the current strategy as it would have performed during the 2008-9 market downturn. We have learned from past crashes that a majority of get in near the top and out near the bottom. Do you want to risk being incorrectly positioned when the next correction comes? The Absolute Return Strategy is available as a mutual fund (IPSAX). For more information, please click here to visit our fund website. DISCLAIMER: The information on this website should not be misconstrued as an offer to buy or sell, or a solicitation to buy or sell securities. Any historical, non-hypothetical performance contained within this website is representative of net-of-fees performance. The past performance of any investment(s) does not necessarily indicate the future performance of any investment(s). No client, current or prospective, should assume the future performance of their investments will be profitable based on the historical performance. All investments have the potential for profit and the potential risk of loss. Changes in investment strategies, contributions or withdrawals may cause the performance results of one’s portfolio to differ materially from the reported composite performance. Different types of investments involve varying degrees of risk, and there can be no assurance that any specific investment will either be suitable or profitable for a client’s portfolio. One should always consult an investment advisor before making any investment decisions.